Dell PowerEdge 2900 Server. Model: PowerEdge 2900. Chassis Type: Main Server Chassis. Manufacturer: Dell Inc. Motherboard: Dell Inc., 0NX642. BIOS: Dell Inc., Version: 2.5.0, Date: 09/12/2008. Optical Drive: PLDS, Type: DVD-R, DVD -RW DH-16A6S. WHAT'SNOT INCLUDED: - Hard Drive / Caddys / Inner Rails / Outer Rails / Cables / Accessories / Software etc. WHAT'S INCLUDED: - Server ONLY. TESTING: - Powers up to BIOS fine without any errors or passwords. Hard Drive 2x 146GB SAS. Dell PowerEdge T100. Make & Model Dell PowerEdge T100. Supports 2x SATA / SAS Drives. Processor Speed 3.00Ghz - Dual Core. Open Office: An alternative office suite perfect for word processing and spreadsheets. WHAT'SNOT INCLUDED: - Inner Rails / Outer Rails / Cables / Accessories / Software etc. SHELF CODE: R42 8/2 13 GH. TESTING: - Powers up to BIOS fine without any errors or passwords. Fans run fine. Any hard drives (if included) are data wiped and work. DELL PowerEdge R610 Rack Server. Processors : XEON E5645 / E5649 / X5650 / X5660 / X5670 / X5675 / X5680 / X5690 POA. Rack Rails: Not Included . Server Options / upgrades . Networking: Dual Integrated 10/100/1000 (1GbE) Network Ports. 6 x 3.5" SCSI Hot Plug Drive Bays -4 x 36GB 15k SCSI Drives Included. Dell PowerEdge 2850 II Rack Mount Server. 2Gb Ram (1Gb x 2). In good condition and in full working order. Comprising this full Specification. Dell PowerEdge 2950 Server. Dell PowerEdge 2950. - RAID Card. Laptop Components. Dell Poweredge R200 Server. Dell Poweredge R200 Server. HARD DRIVE. OPTICAL DRIVE. Optical drive disk trays have been tested. All hard drives have been fully wiped and tested. (If included). Servers have been cleaned inside and out. Dell PowerEdge 2950 II Rack Mount server. 6 x 3.5" SAS Hot Plug Drive Bays - NO DRIVES INCLUDED. CD-ROM Drive. Floppy Drive. Dell 2900 5U Rack Mount Server. ASSEMBLY, BEZEL, 5U, RACK CHASSIS, PE2900. KIT, RACK RAIL, R/V-RAIL, 5U, SLIDE, P2900. 2 x 72GB 10K SAS Hop Plug Hard Drives. PRINTED WIRING ASSY, PLANAR (MOTHERBOARD), SERVER, SERVER CHASSIS, DELL COMPUTER CORPORATION, PE2900, G1. Hard Drive: 1 x 1TB (hot-swap) SATA 7200 rpm. - RAM Installed: 4GB DDR4 SDRAM. Drive SMB and remote office/branch office applications faster with a powerful and expandable 1-socket,high-availability entry rack server. Dell PowerEdge 1950 II 1u Rack Mount Server. 2 x 146Gb SAS Hot plug Drives. Rack Mount Rail Kit. In very good condition and in full working order. Comprising this full Specification. Rackmount Server. Model Number: Poweredge 1850. Optical Drive - 1 x CD ROM, 1 x Floppy Disk. SAS Bays 1U. Model Number: Poweredge 1950. Storage - 2 x 3.5" SAS Bays NO HARD DRVES INCLUDED. No Rails Included. This Dell PowerEdge 1950 has been pulled from a working environment and is fully working. Having been used in a rack, it is scratched externally as you would expect and the front left rack ear is slightly bent as seen in the photo. Although this server accepts two processors, it is only fitted with one. This is an Intel Xeon Quad Core E5345 running at 2.33Ghz. Only 4 of the 8 memory slots are full, each fitted with 1GB of RAM, totalling 4GB. All hard drives have been removed for security reasons, but the server is ready to go apart from that. Fitted with Perc5i, this is a real bargain. I need the space, so have priced this unit very competitively. Dell Poweredge T310. 500GB x2 HDD. Hard Drive. Quad core 2.66GHz. At Albuhera, we specialise in the ever-exciting world of PC components, AV and IT technologies. If you are ordering from outside of the mainland UK, e.g. Dell PowerEdge R330 - rack-mountable - Xeon E3-1220V6 3 GHz - 4 GB - 1 TB. Height (Rack Units)1U. Drive SMB and remote office/branch office applications faster with a powerful and expandable 1-socket,high-availability entry rack server. Product Code 9343. Total Storage 146GB. Product 1850 Poweredge 1u Rack Server. DELL SERVER R7610 PRECISION 1 XEON QUAD CORE E5 - 2603 1.8GHZ 8.0GB 512GB SSD. IBM SERVER X3690 X5 2 X XEON TEN CORE E7- 2860 2.27GHZ 256.0GB NO DISK 7147A6G. Dell M710 Blade Server contains the follow specs:-. 2x Xeon E5520 2216 CPUs @ 2.26Ghz. 4GB of DDR3 Ram. 2x SAS/SATA drive caddies @ 2.5" SAS/SATA drives. Dell PowerEdge 860 4 2.4Ghz CPU, 64 Bit. Fully Operational/Tested. Front Bezel & Rails. Includes a pre-loaded Linux 4.4.0.98, GNU GRUB 2.0.2. Dell PowerEdge 2850 V3 2u rack mount Server. 6 x 146Gb U320 10k hot swap SCSI Drives. 2 x XEON 3.2Ghz Processors. Comprising this full Specification. Rack Mount Rail Kit. 2 x Power Supplies. 4x10 Core E7-8867L. Dell PowerEdge R910. 4 unit of 512gb samsung pro sata ssd dell part number 0VHM7H KG7NR MZ-7PD512BW TOTAL 2.48TB. 40 Cores 80 threads. NEW BOX OF DELL HEAVY DUTY Rail KIT, BEZEL INCLUDED. Dell Poweredge T310. 1TB Of Storage. Few scratches on top of he unit. Perc 6i RAID with battery. 2 x Dell 500GB 7.2K 2.5" SATA 0J770N. Processor -2 x Quad Core E5335 2.00GHz. Optical Drive - DVD Drive. Bezel -Included. Perc5i 5x146GB SAS drives 1 further caddy. 2x dual core Xeon 5140 2.33Ghz. Dell PowerEdge 2950 II. 2 x Dual Core Xeon 5148 2.33GHz. Dell PowerEdge 1950 II Rack Mount Server. DRAC 5 RAID & PERC 5i RAID Cards. 4Gb Ram (1Gb x 4). In good condition and in full working order. PowerEdge R410 SERVER. 4GB RAM (2 x 2GB Sticks). Windows Server 08 R2 COA. Dell PERC 6/iR Sata Raid. 1 x Dell PowerEdge 1955 Blade Server. 2 x 2.5" Hard Drive SAS Bays With 2x Hard Drive Caddies. 1 x 4GB DDR2 Ram. Dell PowerEdge R300 1x Xeon 2-Core E6405 2.13GHz 500GB 2GB. Model No: PowerEdge R300. 2 x Dell PowerEdge 1950 2950 R300 PCI-E Center Riser Board - JH879. RAID 1U Rack Server. Motherboard: TY179. 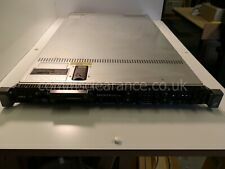 For sale is a Dell PowerEdge R610 1U Server. These servers have been dully diagnostic tested and are in good condition. Dell R610 1U Server 6x 2.5" SFF Chassis. 4x Dell Enterprise 146GB 15K 6G SAS Hard Drives. Dell Poweredge 2950 G2 Server. 1 xDell Poweredge 2950 G2 Server. 2 x Dell Emulex LPE1150-E 4Gb FC LC Single Port HBA. 1 x Pair Of Rails. Includes Rails. CS 204201 -server 204202 -rails. Optical Drive - DVD Drive. 1 x Dell PowerEdge 1855 Blade Server. 2 x 3.5" Hard Drive Ultra320 SCSI Bays With 2x Hard Drive Caddies. 2 x 2GB DDR2 Ram.